Innovative Relocation Mobile Apps – The odds are high that you are reading this post on your phone. While desktop computer user activity has remained relatively stagnant for the past eight years, time spent on mobile devices has more than doubled since 2008. Currently, mobile internet usage has surpassed desktop as the most used digital platform. Just look around. Observe the crowds at train stations, sporting events, restaurants, and, unfortunately, theatres, and you will witness the multitudes of people with their faces glued to the glowing screens of their mobile devices. As a society, we have come to rely on our phones for news, weather, directions, entertainment, and, yes, communication. Now phones can play an important role in corporate relocation. Moving Cost Estimator – A quick and easy tool that can aid a transferee in anticipating what his or her moving costs will be. This is especially helpful if a transferee has a capped or lump sum policy. Buy vs. 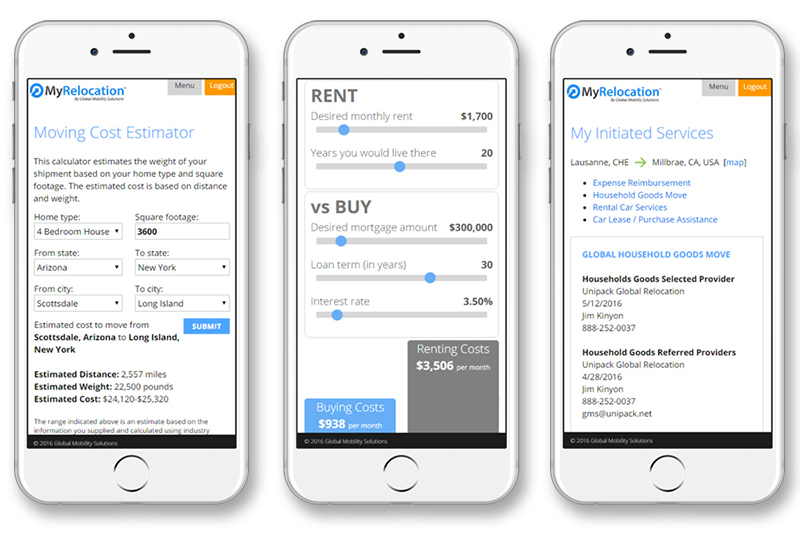 Rent Calculator – This simple to use, dual calculator illustrates what a transferee can expect to pay, over a given period of time when renting a home versus buying a home (spoiler alert: buying wins in almost every scenario). Users don’t even have to type anything in! They can just move the slider to view multiple scenarios. My Initiated Services – Gives the transferee a snapshot of all of the services and contact information associated with his or her relocation. This at-a-glance feature answers the questions, “Which company is going to ship my household goods?” “What’s my realtor’s phone number?” “Where is the place I’m staying for my corporate housing?” and more. It’s all on one page – in one place – in an easy copy/paste format. Innovative relocation mobile apps such as the myrelocation.com mobile app put the power of managing a move in the palm of your transferees’ hands. 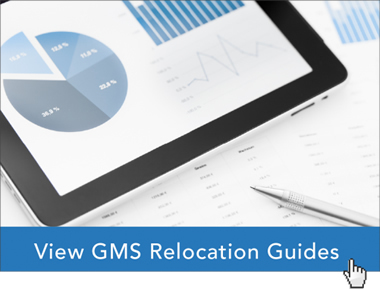 To learn more about how myrelocation.com can not only guide your transferees, but help you better manage the logistics and expenses involved with relocation, please visit http://www.gmsmobility.com/relocation-technology for details and demos.